Two amazing courses. Thirty-six incredible, championship holes. These have made Keystone one of the nation’s most respected golf resorts. Imagine teeing off what is seemingly the edge of the world, launching your ball into the light, clear, Rocky Mountain air. At Keystone, you’re in for some of the greatest golfing of your life…in one of the most spectacular settings you’ll ever experience. 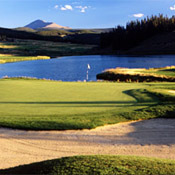 Keystone Ranch Golf Course opened in 1980 and has consistently ranked among the country's best golf courses since then. Rolling hills and alpine lakes, once the site of a lettuce farm and cattle ranch, now serve as the challenging terrain for the 18-hole par-72 golf course.The River Course at Keystone opened to rave reviews in June of 2000. Dr. Michael Hurdzan and Dana Fry designed the environmentally sensitive course, incorporating native plant species, wildlife corridors, and wetlands. Golfers will see sagebrush, native grasses and 12 different kinds of wildflowers. They may also see elk and other wildlife.